“Examine the obvious.” That was a favorite imperative of Dr. Fritz Perls, originator of Gestalt Therapy. The ideal is followed too rarely. Prince Nelson need not have died. Not the way he did, at least: in an elevator, slumped over in an opioid-induced rigor mortis. 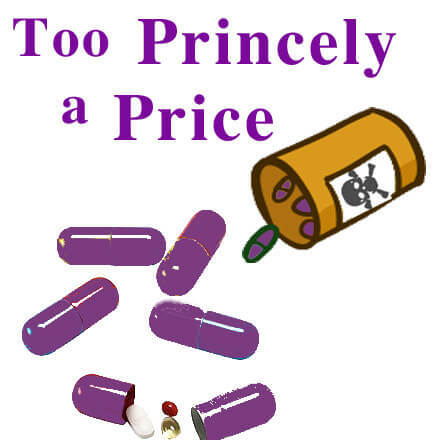 Prince was another of the thousands killed each year unnecessarily by prescription drugs. The numbers are staggering. Since a Journal of the American Medical Association tally in 1998 (JAMA Vol. 279, No. 15), somewhere between two and three million people have died from prescribed pharmaceutical drugs in the United States alone. The JAMA article tallied up 106,000 deaths in one year due to prescriptions that were used in accordance with doctors’ instructions. Prince’s death initiated yet another round of breast beating and handwringing, stump jumping and media chastising. Sanjay Gupta, the CNN media doctor, teamed with Gloria Vanderbilt’s little boy to explore “in depth” the epidemic of opioid addiction. Fingers were pointed and dutifully wagged. Institutions were quoted and statistics cited. Numbers were tossed about and aspersions cast. Yet none of the lip service and tongue wagging came close to doing what Fritz Perls always did first: Examine the obvious. The hand that feeds. In the music jingle business, we used to have a saying: “Give the people what they want.” Schmaltzy music, cliché pop, trendy raps — whatever the client from the ad agency wanted, we gave ‘em. It was our control room mantra when the client was out of the room. “Give the people what they want. Give the people what they want.” Hey, if they pay, they can say. Well, CNN, NBC, CBS, Fox and ABC are part of the problem, not the solution. Turn on your TV at news time and you’ll see the airwaves pummeled with ad after ad for drugs, for whatever malady, real or imagined or caused by drugs themselves. Travel anywhere else in the world or even on this continent and you will see nary such a drug ad. England? Nope. Canada? Nope. Mexico? Nope. Spain, Italy, Russia, Germany, Iceland, India, Botswana, China, Japan? Nope, nope and nope. Not a drug ad in the world except here in the good, old USA. The only exception is the tiny South Pacific island-nation of New Zealand, where you will see a few. But otherwise, the United States is the only country in the world that allows direct-to-consumer (DTC) advertising of pharmaceutical drugs. Since 1997, the Food and Drug Administration, that willing shill for Big Pharma and Big Med, has allowed Big Pharma to advertise directly to consumers. And guess what happened? Drug use has soared. The public wants the latest iPhone, HDTV, bank card, hot rod, minivan, video game and… drug. All the networks are more than happy to take advertising dollars from Big Pharma while broadcasting a news story about Prince’s (presumed) overdose. Advertising a deadly product and creating a demand is unconscionable. Yet, despite an about-face by the American Medical Association on the subject of DTC ads, Big Pharma still gets away with it. In November, 2015, the AMA issued a policy statement recommending that the FDA ban DTC ads. The chances of a ban happening are slim and none, and Slim’s out of town. Now, before any knee-jerk, pro-drug readers suggest we’re dismissing the real suffering of those in need of dire pain relief, let me say we’re not. Pain is a real perception. It has real consequences and deserves treatment. That said, here’s the rub and see if you can follow along. First, you have been warned. The warnings have been issued by nearly every agency and observer that doesn’t have a dog in this fight (i.e. profit motive): Drugs are dangerous. They have bad, really bad, side effects and potential for addiction and death. And, as medical journals tell us, they kill hundreds of thousands yearly. Secondly, follow the money. The people who are presenting drugs as an acceptable and normal choice are making billions off you. They are going to paint their spurious claims in the flashy makeup and trappings of the most desirable harlot in the whorehouse. They’ll tell you they’re safe (when used as directed) and are completely normal to use. Of course they will. They’re making a fortune. Thirdly, there are alternatives to nearly every malady, especially pain control. For pain, acupuncture, hypnosis, herbs, chiropractic, physical therapy and much more can work as well or better than drugs and you won’t end up in an elevator, slumped over, cold and dead. No, Prince need not have died the way he did. Nor have millions of others. I’m steamed about this, yes. Where is the common sense? If someone goes into an emergency room with a minor dog bite, the doctors are required to call the Humane Society and file a police report. Often, the police will followup right then. But if a major celebrity shows up in an ER unresponsive, obviously overdosed enough to require a “Save Shot” (as Prince did) there’s nothing that requires the staff to call the police and report, “Hey, we’ve got someone who appears to be addicted to Big Pharma charms and has od’ed. Shall we keep him here?” No, they can just merrily send the poor fellow on his way without a word to police or medical authorities. That’s just stupid. Until we change the social acceptance and reliance on drugs that a multinational, multibillion-dollar industry has inculcated with the collusion of the government they pay billions to influence, we must all be on guard. Choose better.